Emission nebula LHA 120-N55 shines in this image from the European Southern Observatory's Very Large Telescope. 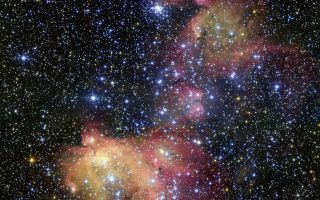 A glowing gas cloud full of young stars shines brightly in a new picture from the European Southern Observatory's Very Large Telescope (VLT) in Chile. The gas cloud, a nebula called LHA 120-N55, is about 163,000 light-years away from Earth and is situated in the Large Magellanic Cloud, a nearby dwarf galaxy that's one of the Milky Way's satellites. The image was taken by the VLT's FOcal Reducer and low dispersion Spectrograph (FORS2), and its location in space is pinpointed in a new video. Those brilliant stars are quite young — too young to have created the superbubble — but they are responsible for the bright colors in the image. Their radiation is stripping away electrons inside the hydrogen atoms of N55, which makes the gas glow; that vibrant glow is seen as an indication of new stars. This region will see a lot of upheaval in a few million years, ESO officials added, when some of these young stars begin to go supernova. "In effect, a bubble will be blown within a superbubble, and the cycle of starry ends and beginnings will carry on in this close neighbour of our home galaxy," they said.